You’ve got your visa, your flight is booked and your bags are all packed. You’re braced to start this new, brave and understandably tough (at first) chapter in your life. Everything that you read about Ireland is mostly the big picture stuff — the awe-striking, wondrous image of a really beautiful country. But nobody talks about everyday things, do they? In this blog, I’m going to give you the lowdown on the little things about living in Ireland, which make it such a remarkable experience. However, you are better off knowing these before you arrive, so that you can be mentally and emotionally prepared. Where I come from, the weather is mostly toasty or pleasantly cold. The temperature tends to stay in the teens, rarely dropping below the double digits. Also, the sun rises and sets at relatively reasonable hours. I am used to seeing sunrise around 7am and sunset around 6pm — But not in Ireland, and certainly not in winter. Be ready for complete darkness in the morning until around 8am, which makes it all the more difficult to get out of bed! And as for the sunset during winter— It gets dark before 5pm, but at least that means I can have two dinners. A: If you heat a vessel to the 6th (and highest) option, it will become very hot, very fast. If you go with one of the lower options, it takes longer. B: If the pots or pans you’re using are thin at the bottom, food will stick and possibly burn — so don’t go above the fourth setting. C: When the food is cooked, the hob stays hot so take it off the hob immediately or else it will keep cooking and might burn. Alternatively, turn off the heat a few minutes before the food is cooked. D: And finally, always check if the main switch for the hob is on. I say this from personal experience; I’ve ‘cooked’ entire dishes for 10-15 minutes at a time with the hob turned to 6, but not actually working because the main switch was off. I come from India; we always have white or bluish lights in our homes, offices, shops, restaurants — pretty much everywhere. The yellow Edison bulb has become a rare sight back home. So when I moved to Dublin and turned on the yellow-ish lights in my apartment for the first time, you can imagine my alarm. I know that a lot of students coming here are already accustomed to yellow lights in their homes, but if you’re like me, brace yourself — It will take some time getting used to. Alternatively, do what I did and buy some white bulbs. Space is relatively limited in Ireland when you’re a student. Owing to the current housing crisis and rising rates of properties, all students either live in college accommodations, shared apartments/houses, hosted homes or studio apartments. Either way, you may be restricted to a room, which you will eventually become creative with and start using smartly. For example, my husband and I use the shoe rack for three things: The top section houses our ‘laundry bag’ (which is actually the duvet bag reconstituted to hold our laundry) and the iron. The middle section is for shoes, slippers, and sometimes, even socks. Right at the bottom is for toiletries and medicines. We also make use of the ample space on the windowsill to store our vegetables, plastics and crockery. The weather in Ireland is certainly amusing — Well, that’s one way to put it. I call it bipolar. Sun one minute; rain the next, followed by winds, and then rain coupled with sunlight. My tip for handling this strange phenomenon is to buy a rain-proof winter jacket and carry an umbrella. Also, buy waterproof shoes; the sports shoes, sneakers or sandals you bring from home will get wet each time you step out. Think of it this way; you’re preparing for the weather like you prepare for bumping into your annoying neighbour — smartly. Sorry to say, this one’s inescapable. If you’re someone who hates food going to waste, as almost everyone does, this is going to hurt a bit. When you are starting out, it will take some time to get the hang of groceries and other utilities — primarily when it comes to quantity. Most of us are used to having our moms or someone else take care of all that, so it’s understandable that you might buy more than you can finish at the beginning. If you are under the impression that the cold weather will keep the food fresh for longer, you’re wrong. Remember that vegetables do go bad pretty fast, even in the refrigerator — as do eggs, sauces, yoghurt, bread and anything else. It’s tempting to buy groceries in bulk to avoid going out in the cold every couple of days, but it’s best to only buy as much as you can finish in a week. Don’t worry; you’ll get the hang of it. For those of you who hate walking, it’s not good news. Likewise, for those who would rather walk 10km than take the bus. When you move to Ireland, you have to get into the habit of walking and using public transport. The good news is that the roads are really great and the weather is quite suitable for walking. It actually makes you feel warmer. Also, the buses, LUAS trams and trains are always on time, located quite conveniently and are actually quite fun to travel in. 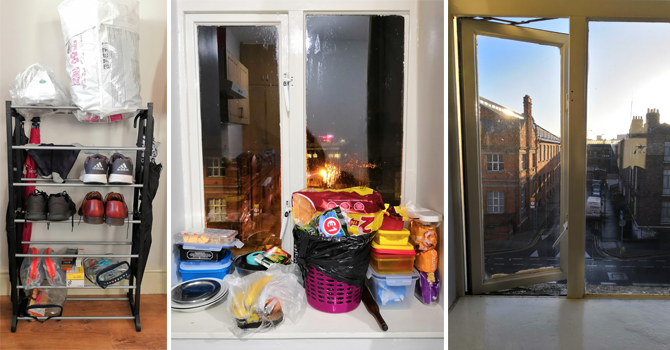 When I first reached Dublin, I had to carry my 20-kilogram bag all the way from the city centre to the hostel room I’d booked — It was only about 800 meters but truly felt like eternity. I probably hadn’t worked that hard all year in the gym, combined. It’s the little things in life that make it the adventure it is and living in Ireland has been an adventure, albeit a fun one. Getting used to the lifestyle of any place takes time and I hope this blog is of use to you, so that your transition is a smooth one. This is a great experience u have shared .. I match your experience in my day today life.. Similar to my experience when I moved base to Toronto. Completely relatable and a good one!